Ever wake up in the morning and feel ten years older than you really are? That was me this morning. And I still don't feel right. I think I got too much sleep, if such a thing is possible. Didn't crawl out of bed until almost ten o'clock! The rest of the week I'll be up before seven. I met a friend for lunch today. We get together once or twice a month. I always feel better after meeting with an old friend. I have many acquaintances but only a handful of long time friends that I've kept in contact over the years. And I'm talking as much as thirty-five, forty years! Laura and I always meet halfway between where we live. It's fish camp and today it was nice enough to sit out on the open porch on the water. They have the best hamburgers, and scallops but you can only get those for dinner. 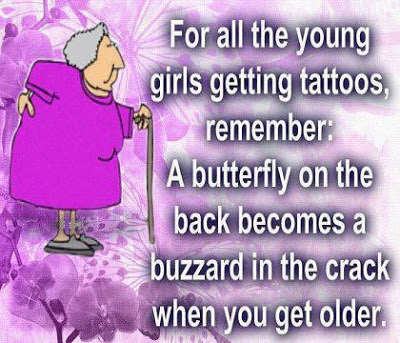 Getting a tattoo is on my bucket list but it won't be anywhere near as big as a butterfly, or anywhere close to an area that will become misshapen with age. I'm thinking of something like a flower or ladybug on my ankle.